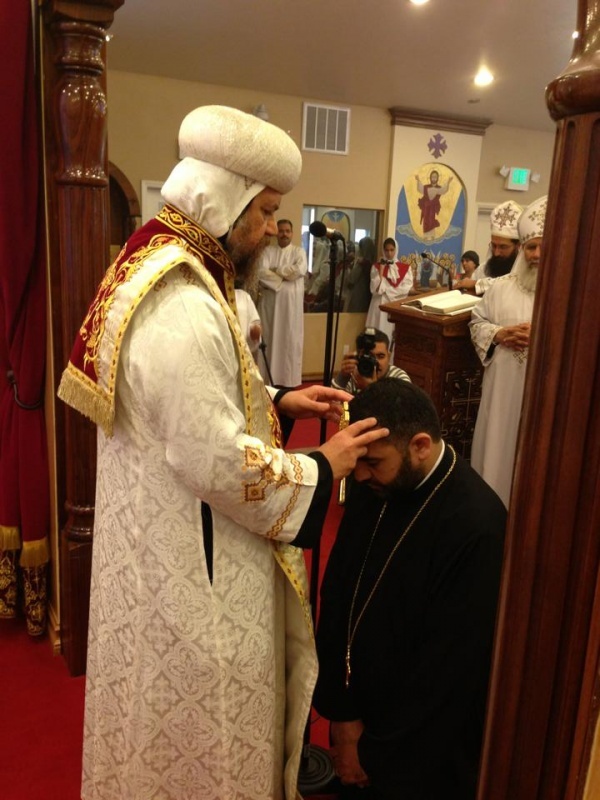 On Sunday, November 24, His Grace Bishop Serapion laid hands on, and ordained, Deacon Raphael Maher as a presbyter to serve at St. Abanoub and St. Antony Church in Norco. Attending the ordination were several diocesan priests, including Fr. Felimon Mahrous, Fr. Mina Girgis, and Fr. Michael Fanous in addition to the fathers of the parish. Father Raphael will travel, God willing, to the Monastery of Abba Pishoy in Wadi El Natroun to complete his 40 days of fasting, prayer, and meditation before returning to begin his service. His Grace also elevated Deacon Arsanious Wissa to the rank of Archdeacon to continue his service at the same parish. May God bless the service of the new presbyter and archdeacon, and grant them the fruit of the Holy Spirit.